All clips belong to the MLB. Sorry for forgetting the Royals last time. who though this said "ironic"
Lol, you go from an iconic call (13:03), to one of the most boring calls (considering the actual play) in recent memory (13:45). Rockies question… How is the Baker hit more iconic than the Holiday slide in the 2007 Tiebreaker, the final out of the 2007 NLCS, or the first at bat in team history (Eric Young home run in front of one of the largest MLB crowds in history)? I guess it's a case of iconic moment versus player, I checked this after seeing greatest moment for each video, it had Aaron's 715th & this Cabrera's hit in '92, I admit it's a tough call. Same with them having Ripken's 2131 versus the '83 HR here which showed genius left over from Weaver (who retired a year earlier) of platoons, index cards w/matchups before computers, etc.. You could make a good argument for either, though again I prefer Ripken's. And the Yankees, so many to choose from! As a Braves fan who was around in 92, I can tell you that Cabrera's winning hit was amazing. Definitely in the top 5 of Braves moments. However, nothing, and I mean nothing, can top Hank's home run. Not even the final out of the 95 World Series. Any Braves fan who actually follows the history of the game will tell you that no moment is more revered in Atlanta history by its fans than 715. I'm a Yankee fan and I love the Boone home run but it's definitely not their most iconic moment. Seriously? 100 Years of crazy history and this is the moment? My favorite part was when they showed all the best moments from each team. What about Detroit winning the World Series in 1984 and the residents of the city almost burning the town to the ground? You put the 86 Mets on here, bad memories for us sox fans. Love how the Nationals is winning an ALDS game in a series they lost is their most iconic moment. 2. For Royals: I love that 1985 Game 6 moment, but George Brett's massive homer off Gossage to win 1980 NLCS is my bet as the Royals finally won the pennant (after 3 straight losses in ALCS to Yankees in 1976-78), in what was the highlight moment of George Brett's tremendous MVP season. Or why not Cal Ripken's 2,131st consecutive game in 1995? But for LA Dodgers, yup, Gibson in 1988 is it! 8. SF Giants: they have their own pedigree after their NY days. Travis Ishikawa's walk-off pennant winning home run? 9. Indians: The 1997 pennant. Sandy Amoros' solo homer off Mariano to tie Game 4 of ALCS. 10. Yankees: Imho, it just cannot be that Aaron Boone homer for a team which has won 27 titles. No way. They didn't even win Series that year, and iconic as that Boone blast was, the 8th inning Yankees rally off Pedro Martinez was really the story of that game 7 in 2003 ALCS. So, there's a lot of other choices: Babe Ruth's siging with them in 1920 or his called home run in 1932 World Series; Gehrig's farewell on July 4, 1939 or Joe D's 56-game hitting streak; the perfect game by Don Larsen in Game 5 of 1956 World Series (Mantle also had a great catch and hit a home run in that same game); Maris' 61s HR in 1961, etc. But if we want something more modern, I go with Reggie's 3 homers in Game 6 of 1977 World Series, especially that last one which might still be traveling. 11. Athletics: their 20-game winning streak in 2002 (Scott Hatteberg's walkoff homer to win 20th straight). More famous even that their 1972-74 threepeat with Reggie Jackson and Rollie Fingers company since it was featured in Moneyball! 12. Astros: this video was made before 2017 World Series but after that Series, there will certainly be a new moment listed for Astros if this video is updated. Game 5 alone was full of them. I liked the Jose Altuve home run in bottom of 5th to tie score at 7-7. But all choices here are iconic moments. Thanks for this! Poor buckner seriously, bad karma, that ball had so much spin. Joe Morgan. My most valuable baseball card. And just see. Scoring Griffey and making it to 2nd. Such a smart player. My respects #8 of the reds. Really a special person for me. Cubs moment should be Bartman. Easily more emblematic of their history that a one-off statistical anomaly. Red Sox moment should be Fisk in game 6 1975. It's 2018 and the Washington Nationals STILL haven't won a damn thing. Here's what an updated list should look like. Atlanta Braves: Either Sid Bream's Slide, Hank Aaron's 715th Home Run, or the Braves clinching the 1995 World Series. Miami Marlins: Obviously the 1997 World Series Game 7 Walk Off. New York Mets: Bill Buckner's Blunder. Philadelphia Phillies: Tug McGraw getting the final strikeout to win the 1980 World Series or Roy Halladay pitching a no-hitter in Game 1 of the 2010 NLDS. Washington Nationals: Jayson Werth hitting a walk off home run to force a Game 5 in the 2012 NLDS. Chicago Cubs: Do I even have to say it? But you also have to add Ben Zobrist's base hit that allowed that to happen. Cincinnati Reds: Pete Rose's 4192nd hit (Yes I know Rose got into a betting scandal). Milwaukee Brewers: Cecil Cooper's 1982 ALCS (yes the Brewers were once in the American League) winning hit. Pittsburgh Pirates: Bill Mazeroski's walk off home run in Game 7 of the 1960 World Series. St. Louis Cardinals: Game 6 of the 2011 World Series. You have to add Lance Berkman's base hit that tied the game again. Arizona Diamondbacks: Luis Gonzalez's game winning hit in Game 7 of the 2001 World Series. Colorado Rockies: Todd Helton's game winning hit in the 2007 NL Wild Card Tiebreaker. Los Angeles Dodgers: Kirk Gibson's walk off home run in Game 1 of the 1988 World Series. San Diego Padres: Steve Garvey's walk off home run in Game 4 of the 1984 NLCS. San Francisco Giants: It depends on if you are talking about the Giants in general or just in San Fran. If you are talking about the Giants in general, then it obviously would have to be Bobby Thompson's "Shot Heard 'Round the World." Or maybe Willy Mays making "The Catch" in Game 1 of the 1954 World Series. But you are only talking about the team in San Francisco, then I would say Edgar Renteria's go ahead home run in Game 5 of the 2010 World Series, as that not only would be what ended up being the clinching hit to the team's first World Series Championship since 1954, but it was also the beginning of a dynasty that the team had in the first half of the 2010s (the Giants would win 2 more World Series in 2012 and 2014). Baltimore Orioles: Either Tito Landrum's go ahead home run in Game 4 of the 1983 ALCS or, in my opinion, the better choice, Cal Ripken Jr.'s 2131st consecutive game, passing the Iron Horse, Lou Gehrig. Boston Red Sox: Anything related to the "Reverse of the Curse (of the Bambino)." You can put Dave Roberts' stolen base, Bill Mueller's game tying hit, and Big Papi's walk off home run, all in Game 4 of the 2004 ALCS, Big Papi's game winning hit in Game 5 of that same series, the Red Sox winning the American League pennant after being down 3 games to none in that series, and then to wrap it all up, the Red Sox sweeping the St. Louis Cardinals in the 2004 World Series to finish the "Reverse of the Curse." New York Yankees: There are many things that you can put for the Yankees. You could put Babe Ruth's called home run shot, Don Larsen's Perfect Game in the 1956 World Series, Chris Chambliss' 1976 ALCS clinching walk off home run in Game 5, Reggie Jackson's 3 home runs in Game 6 of the 1977 World Series, Jimmy Leyritz's game tying home run in Game 4 of the 1996 World Series, Tino Martinez tying Game 4 of the 2001 World Series and then Derek Jeter walking it off with his "Mr. November" home run, Scott Brosius doing the exact same thing Tino did the previous game (Game 5 of the 2001 World Series), or Aaron Boone's blast to walk off Game 7 of the 2003 World Series. There are plenty of more choices, but if I had to choose, I would say either Chambliss' 1976 ALCS clinching walk off home run, Reggie Jackson's 3 home runs in Game 6 of the 1977 World Series, or Boone's walk off blast in Game 7 of the 2003 ALCS. Tampa Bay Rays: Either the Rays winning the 2008 ALCS or Evan Longoria clinching the 2011 American League Wild Card with a walk off home run in the last game of the regular season (Game 162). Chicago White Sox: I guess Scott Podsednik's walk off home run in Game 2 of the 2005 World Series. Either that, or the Sox sweeping the Houston Astros (they were in the National League back then) in that same series to win the team's first World Series since 1917. Cleveland Indians: While Rajai Davis' game tying home run in Game 7 of the 2016 World Series was awesome, the Indians didn't end up winning. So I have to not allow that one. I would say either Tony Pena's walk off home run in Game 1 of the 1995 ALDS, giving the Indians their first postseason win since 1948, Eddie Murray's game winning hit in Game 3 of the 1995 World Series, or Sandy Alomar Jr.'s game tying home run in Game 4 of the 1997 ALDS. Detroit Tigers: Magglio Ordonez hitting a walk off home run to send the Tigers to the 2006 World Series, sweeping the Oakland Athletics in the 2006 ALCS. Kansas City Royals: Dane Iorg's blooped single that won Game 6 of the 1985 World Series, after the controversial call at first base of Jorge Orta being called safe. Minnesota Twins: It definitely would be from the 1991 World Series. It would be either Kirby Puckett's walk off home run in Game 6, or Dan Gladden's walk off base hit in Game 7 that clinched the series. Houston Astros: I'm sorry Chris Burke, but your walk off home run to clinch the 2005 NLDS is not the greatest moment of the Houston Astros anymore. That distinction would now go to all of the game tying home runs in Game 5 of the 2017 World Series (particularly the one by Yuli Gurriel), and then Alex Bregman's walk off base hit in that same game. Los Angeles Angels: The comeback in Game 6 of the 2002 World Series. Oakland Athletics: The A's sweeping the 1989 World Series, mostly because of the Loma Prima Earthquake. It was actually really good that the two San Francisco Bay Area teams played in the 1989 World Series, as the Bay Area was the biggest place where the earthquake hit. (If the Giants won that World Series, then I would have said that would be the greatest moment for the Giants, at least in San Francisco). Seattle Mariners: Edgar Martinez hitting "The Double" in Game 5 of the 1995 ALDS. 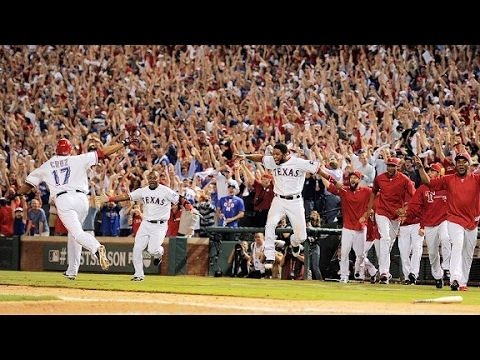 Texas Rangers: The Rangers winning their first American League pennant in 2010.